One of the ombuds institutions competent for military personnel with which EUROMIL is in contact with through the yearly meetings of the International Conference of Ombuds Institutions for the Armed Forces (ICOAF), is the office of the Public Defender (Ombudsman) of Georgia. At the occasion of the spring 2017 NATO Parliamentary Assembly in Tbilisi, EUROMIL’s President Emmanuel Jacob had a meeting with the Public Defender in Tbilisi. One of the discussed topics was a possible round table meeting on military rights in Georgia. 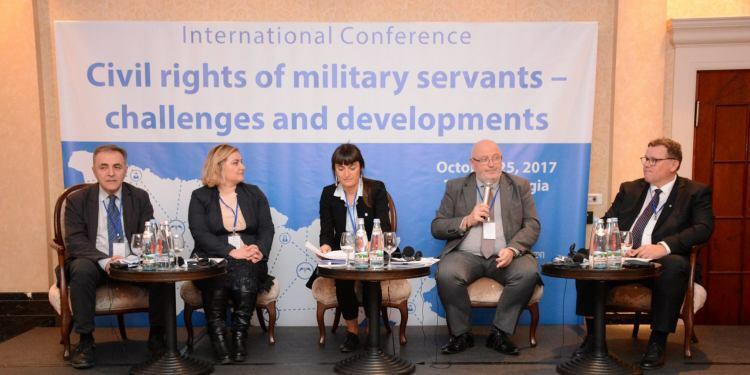 The Public Defender, Mr. Ucha Nanuashvili, kept his word and organised on 25 October 2017 an international conference entitled “Civil rights of military servants – challenges and developments”. In three separate sessions, the participants discussed a variety of human rights related topics: institutions working on military rights, military rights, especially the right of association and the freedom of expression of military personnel. In his opening speech, Mr. Nanuashvili, explained that the Public Defender of Georgia already made several recommendations to the Parliament in his yearly report. However, the “Department of Human Rights in the Armed Forces” of the Public Defender of Georgia has only been established in 2015. Nevertheless, they are improving their field of action and a recent visit to the Georgian troops in Afghanistan was a new experience for the Public Defender’s Office. The Deputy Minister of Defence, Mr. Nukri Gelashvili, explained that the Minister of Defence is following up on the recommendations of the Public Defender. The legal protection of military personnel is high on the governments agenda. Military personnel’s rights and obligations are an important issue. However, the Deputy Minister continued, these rights must always be proportionate vis à vis the public interest. Looking for a right balance is an essential element of the debate on human rights in the armed forces. EUROMIL’s President Emmanuel Jacob was invited as speaker in the second session on the freedom of association and assembly. After a brief presentation of EUROMIL, President Jacob gave a summary of the international regulation on the right of association of military personnel. Focussing on the European Convention on Human Rights (ECHR), especially article 11, and the European Social Charter (ESC), in particular article 5, he said that Georgia cannot ratify these instruments and refuse to implement them afterwards. The judgments of the European Court on Human Rights in the cases Adefdromil and Matelly vs France (article 11 ECHR) made clear that military personnel have the right to join military associations or trade unions. Furthermore, President Jacob expects that the case of EUROMIL vs Ireland before the Social Charter Committee aiming at trade union rights for military personnel in Ireland, will be successful. After explaining the details of several national situations regarding the implementation of association rights and a successful social dialogue, the President raised the question why this should work in Germany, the Netherlands, Finland, … and not in Georgia? Very interesting was the intervention of Ms. Tamar Gabisonia of the Georgian Trade Union Confederation (GTUC). Ms. Gabisonia explained the work of the GTUC in general and more specific in the public sector. She admitted that they were never actively working in the armed forces. However, this discussion made her look closer to the case and she complimented EUROMIL for the work done in this field. Ms. Gabisonia and Mr. Jacob agreed to look into possibilities for closer cooperation with the aim to develop trade unionism for Georgian military personnel.